Precious miniature. 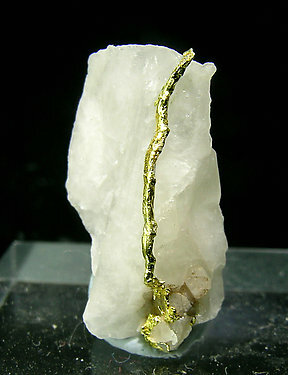 An elongated wire growth, practically cylindrical, on a matrix of white Quartz. Wire forms are very rare with Gold and this find from Venezuela was one of the main novelties at Tucson 2007. Precious miniature. An elongated wire growth, practically cylindrical, with small Quartz matrix. The growth on the base of the specimen is quite different and there are crystals of quite well-defined crystalline forms. 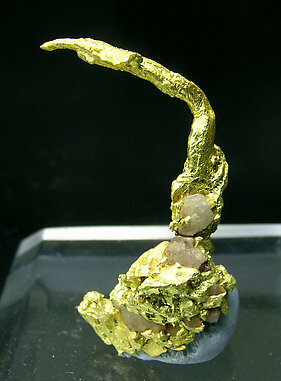 Wire forms are very rare with Gold and this find from Venezuela was one of the main novelties at Tucson 2007.